Mountain House | ProMinent Fluid Controls, Inc. Effectively mixing polymer to a homogeneous and fully activated solution reduces polymer consumption at California treatment plant by 23%. Mountain House is a planned community covering 4,784 acres in San Joaquin County, California, is approximately 150 miles east of the City of Oakland. The current population of the community is around 12,000. The first home here was built in early 2003, but expansion stopped in 2008 due to a downward economy. The wastewater treatment plant serving the community is designed for 3 mgd and is currently underloaded, at approximately 0.7 mgd. Since 2011, however, development has again accelerated. Some 15,500 households, or approximately 40,000 people, are anticipated when Mountain House is fully completed. The treatment plant, at its current design, should accommodate the needs of Mountain House residents and businesses up until about 75 percent buildout. House treatment plant has a very small footprint, residing on less than two acres. Unlike conventional flow-through treatment processes, the SBR process incorporates all the separate stages of activated sludge treatment within the same basin. At the Mountain House WRF, each SBR cycle includes an anoxic selector stage, aeration stages, a clarification stage, and a decant stage to discharge the treated effluent. The decant stage is when the top four feet of clear water is released into the plant’s surge basin. It’s then pumped from the basin through tertiary filters (cloth media filters) followed by UV disinfection prior to discharge. The Mountain House WRF is among the first facilities in the United States to utilize a UV Disinfection System certified under NWRI to meet California Title 22 requirements. Waste activated sludge accumulated in the process’s settling stage is pumped to two aerobic digesters. Typically, sludge is thickened through a drum thickener after leaving one of the plant’s digesters and from there goes into the plant’s second digester and then pumped into a high-speed centrifuge for dewatering. 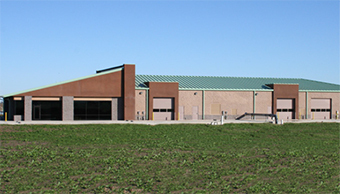 The plant’s dewatered solids are sent to a compost facility in nearby Merced County. Last year, the plant underwent a series of changes in its polymer use for sludge thickening and dewatering. These changes were part of a comprehensive process carried out because management determined the plant was not attaining adequate solids capture. Large amounts of centrate in the plant’s centrifuge were being returned back to the plant. Because polymer is fed to the waste-activated sludge prior to thickening and dewatering to aid in liquid-solid separation, the first thing management looked closely at was the facility’s polymer preparation and feed systems. The Mountain House plant was using conventional mixing and feed systems to prepare its polymer prior to use. Although polymer was being prepared and fed automatically, the units were still characterized by wasted polymer. Ineffective activation can create considerable polymer shear, resulting in excessive polymer consumption. Insufficient initial mixing energy generated by the plant’s polymer mixing systems also created large quantities of fisheyes (entrapped, undissolved masses of polymer) that made no contribution to the sludge conditioning processes. High shear following the initial wetting of the polymer solution caused considerable numbers of polymetric chains to be broken, eliminating the effectiveness in the liquid-solid separation process. As a result, excessive amounts of polymer were being consumed. 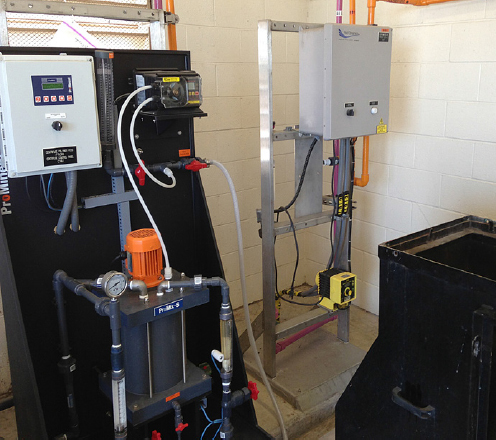 In March 2013, the Mountain House WRF began a 60-day trial of a ProMix- S TA Series Polymer Feed System, from ProMinent Fluid Controls, Inc. to control feed water and polymer and combine them to produce a high quality solution. The system is designed to receive emulsion polymer while mixing it with feed water to produce and discharge a quality solution. The ProMix® unit provides a multi-zone mixing chamber that delivers a tapered energy profile for proper polymer activation.This engineered profile effectively hydrates and mixes the polymer to a homogenous and fully activated solution, providing only light agitation in the mixing tank to allow for the full extension of polymer chains. During the trial, the plant recorded a number of variables, including: digested sludge flow rate; reclaimed water flow rate (polymer dilution water); polymer neat pump flow rate and polymer use (in inches). From this data the percent polymer concentration was calculated on a daily basis while operating the plant’s drum thickener and decanting centrifuge. Because only one ProMix® feed system was used during the trial, only one of the dewatering systems (drum thickener and centrifuge) could be used at a time with the trial unit. Based on the recommendation of the ProMinent representative, the operator started the polymer feeder at a 5% polymer solution setpoint and ended with about a 3% polymer solution setpoint. Dewatering characteristics before and after the trial were noticeably different at the plant in terms of thickened sludge quality and a reduction in solids recycle from the centrifuge centrate. Polymer usage was reduced by about 23% at an average polymer solution concentration of 0.293%. Polymer Feeders, one dedicated to the drum thickener and the other to the plant’s decanting centrifuge. A two-year payback for the new systems was calculated, based solely on polymer savings. Each new polymer feed system provides an LCD display (including primary and secondary flow display) with touchpad control, remote start/stop and programmable auto-flush. The unit maintains desired concentration based on primary and secondary dilution water flow. Gaining optimum polymer activation through a 3-stage mixing regimen played a key role in optimizing dewatering operations at the plant. 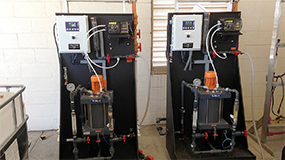 A second major improvement occurred after the installation of the two new polymer mixing units. Although plant management was very pleased with the improvements gained in polymer performance, it remained not fully satisfied with the plant’s centrifuge performance regarding solids capture. 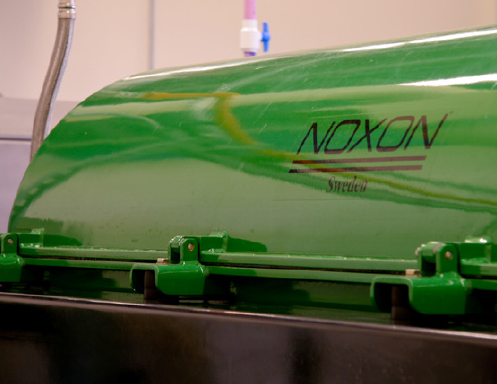 Peter Gagne, a representative from centrifuge manufacturer Noxon was called in and, after observing centrifuge operation and performing jar tests, he recommended that the plant get with its polymer vender, Polydyne, to determine an alternative. 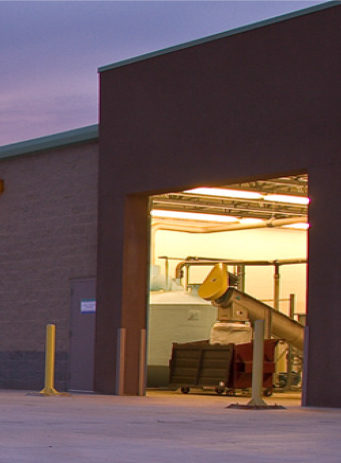 Polydyne subsequently adjusted the plant’s polymer formulation, and this was the major final key in optimizing dewatering at the plant.